"Brand management for a wired world." Advanced Internet technologies and the emergence of new social media platforms have influenced brand management in general but also created new challenges. Brand managers have not only lost their power over creating brand images but also their control over most conversations about their brands. Marketers need to accept the fact that they are nowadays co‑creating brands with consumers and use this to their advantage (Hays et al. 2013; Fournier & Avery, 2011). There are many different strategies to make content created by consumers to a powerful marketing tool in everyday business life. Additionally, the aim for a marketer should be the following: create content which is not only relevant to the target audience, but also expresses the brand values and builds a community around the brand (Albastroiu & Felea, 2014; Hays et al. 2013). Destination brand management is rather difficult due to the complex and diverse set of all products and services that need to be combined under one brand. Furthermore, it is rather intangible as the brand experience is dependent on the personal experience of tourists (Hays et al. 2013). Therefore, the challenge for a destination marketing organization (DMO) is providing a consistent brand promise (Schaar, 2013). A good example for delivering a unique destination brand is Tourism New Zealand. With the help of a global campaign, called 100% Pure New Zealand, the tourism organization has marketed the country for more than 16 years. 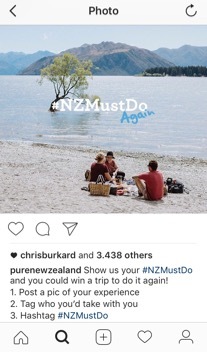 Tourism New Zealand does not only tell a consistent and authentic brand story, but also puts great effort into making use of tourist‑created content, especially on Instagram (Tourism New Zealand, 2015). The purpose of this paper is to show that destination marketing managers need to acknowledge the increasing tourist‑created content on social media platforms. Furthermore, it highlights advantages of using Instagram and hashtags in the brand‑creation‑process for destination marketing organizations. By showing some good examples of Tourism New Zealand, this paper gives some ideas on how to use tourist‑created content as a marketing tool in order to become relevant in the brand conversation again. In general, destination branding is the process of creating an image and a set of meanings in tourists’ heads. A destination brand is the sum of all characteristics that define a destination which results in a unique brand positioning that can help differentiate from competitive destinations. Tourists put all their experiences and emotional values together and in this way, create a certain image of a destination. Therefore, it is essential for DMOs to identify brand values together with tourists and deliver a consistent emotional message across all channels (Schaar, 2013; Morgan et al., 2002). Nowadays, destination brand management is more challenging than ever before as tourists take part in the brand‑creation‑process. Social media platforms give tourists greater possibilities to share their personal experiences of destinations and thus, tourists gain more power to define what the destination looks like (Fournier & Avery, 2011). Labrecque et al. (2013) add that social media has not only given tourists the ability to create their own personalized content but also to share their opinions and knowledge with “anyone willing to listen” (Labrecque et al. 2013). In other words, more and more people are involved in conversations around destination brands. This results in a co‑creation with tourists, which makes the process even more complex for DMOs. Additionally, social media is a popular source among tourists when searching for new inspirational destinations or information on a specific destination (Dickinger & Lalicic, 2015). Today, social media platforms have made access to information easier. However, there is also a countless number of content created by tourists as well as destination marketing organizations. This raises the question of how people decide what content to consume. Albastroiu & Felea (2014) say that people consider opinions and experiences by other tourists more trustworthy and more authentic. Tourist‑created content is highly credible, especially to people who have never been to the specific destination. People connect with each other and build a relationship by sharing their personal travel experiences (Albastroiu & Felea, 2014; Fournier & Avery, 2011). A parallel argument by other authors is that the content provided by destination marketing organizations is often seen as staged and persuasive (Shen et al., 2015; Albastroiu & Felea, 2014; Digital Tourism Think Tank, 2014; Munar 2011). Consequently, DMOs have a difficult time to stay in the conversation around their destination as tourists believe other tourists’ opinions are more credible. Gonzalo (2014) stated: „Yet, there is one tool that has become a weapon of mass seduction in travel marketing, in particular at the destination level: Instagram.” In his opinion, Instagram is a great tourism marketing tool due to its popularity and its great possibilities (Gonzalo, 2014). It provides individual tourists and DMOs with different tools to preserve, share and gather experiences and information intensively (Fatani & Suyadnya, 2015). People can capture and share travel moments that are significant to them. They can edit photos and videos effortlessly with diverse filters and tools to easily adjust brightness, contrast and more (Instagram, n.d.). Murton (2014) also states that Instagram is a “natural fit for tourism” as visuals are more successful in showing the beauty of a destination than describing it with words (Murton, 2014). He adds that people are naturally taking photos and videos of places. They want to share what they have seen and experienced with friends, family as well as strangers on social media. Instagram introduced a new feature called stories which also “feeds into the desire everyone has to share their travel experiences” (Murton, 2014). This feature refers to images and videos that can be uploaded within someone’s Instagram account and disappear after 24 hours. In other words, people can upload what they see, do or experience in that very moment (Instagram, n.d.). According to Wikipedia (n.d.) a hashtag is a type of label which is primarily used for categorizing images, videos or messages on social media platforms. Everyone can create a hashtag by using the hash character #, also called pound sign, in front of a word or phrase. Hashtags emerged organically on the social microblog Twitter to categorize certain messages. The biggest advantage of a hashtag is that searching for information is made simple (Fatani & Suyadnya, 2015). Additionally, hashtags can be used to start, follow or join a conversation. They can also be used to encourage interaction and connect people worldwide. However, there is a risk of people using wrong words or the wrong word order. This can not only lead to confusing customers but also makes interaction and information seeking more difficult (Giannoulakis & Tsapatsoulis, 2016; Wikipedia, n.d.). All of these benefits of hashtags are particularly important in destination marketing. DMOs can create their own original hashtags and start a conversation about their destination. They can follow existing conversations and in this way, possibly generate new insights. DMOs can also easily engage with their customers and re‑post the tourist‑created content to enhance the brand co‑creation with the help and power of hashtags. Like stated before, Tourism New Zealand is the official destination marketing organization for New Zealand. The organization identified the need to create a powerful destination brand in order to distinguish from their closest competitors many years ago. Therefore, Tourism New Zealand conducted a study to gain insights from potential tourists around the globe. The result of this research was that the world considered New Zealand to be a boring country “full of green hills, sheep and aggressive Maori warriors” (Morgan et al. 2002). Furthermore, other concerns of travelling to New Zealand were pointed out by participants: lack of guaranteed sunshine; distance and costs involved; only outdoor experiences; lack of culture, shopping and nightlife. Apart from this criticism, New Zealand was characterized as having a “warm, friendly and welcoming” culture and “a unique Maori heritage” (Morgan et al. 2002). After the study, Tourism New Zealand identified four themes: landscape; people; adventure and culture; and started the country’s first global branding strategy with a marketing campaign called 100% Pure New Zealand (Morgan et al. 2002). According to the Tourism New Zealand website, the goals are to always stay authentic and to tell an iconic destination story. The campaign has evolved to one of the world’s most successful in the tourism industry and its focus has shifted to a strong presence within the digital world. As New Zealand is a small player in the global tourism market, it doesn’t have big marketing budgets. Most of the budget is nowadays invested in digital marketing (Stoppress, 2015). Tourism New Zealand is active on selected social networks, such as Facebook, Instagram, YouTube and Twitter. Andrew Fraser, the marketing director of Tourism New Zealand (2015) claims that Instagram is an important part in the dreaming stage of travel planning. He also adds that it is a great channel to start conversations around the brand and create inspiration for future travelling. The three core principles of using Instagram for the brand are: community first; simplicity matters and inspire creativity (Tourism New Zealand, 2015). Additionally, they actively ask people to share their experiences with New Zealand on the different social media platforms by using the original hashtags (see Figure 3 and 4). Overall, the brand uses the original hashtags across all media channels, but their focus lies on Instagram. In addition to the actions taken on Instagram, they also share all the pictures with the hashtag #NZMustDo on their official website (Tourism New Zealand, 2015). In conclusion, social media platforms and technological advances have created new challenges in brand management, especially destination brand management. Branding in the tourism field is rather difficult as it is more complex and immaterial than other products. A destination brand is to some extent dependent on the personal experience of tourists. Nowadays, tourists have the desire to preserve their travel experiences by sharing pictures and videos on social media platforms, such as Instagram. In this way, they are an important part of the conversation around destinations and co‑create the destination brand. Destination marketing organizations need to understand and accept this shift. This tourist‑created content can be used by DMOs to their advantage, as the example of Tourism New Zealand shows. Not only have they established brand values with the help of potential tourists, but also are very open towards co‑creation with tourists. They created their own unique hashtags to gather images and videos from tourists on Instagram, which they then re‑post on their own account and share on their official website. Other destination brands can use Tourism New Zealand as a great example and try to follow some of the basic actions they take.